The Flentrop Pipe Organ at St. Columba's Episcopal Church, Washington, D.C. The present stone church that is St. Columba's was dedicated in 1927 replacing a wooden frame church on the corner of Albemarle and 42nd Streets in Tenleytown, in the upper northwest part of Washington, D.C. The church was founded in 1874, as a "child of St. Alban's", a mission church of the older parish on Wisconsin Avenue. Lewis and Hitchcock, a well-known Washington organ builder, soon installed a new electro-pneumatic pipe organ in the new building. This instrument, serving faithfully for 50 years, spoke from a side chamber into the divided chancel in what is now St. Aidan's Chapel. The instrument suffered the ravages of time and climate and by the early 1970's it became apparent that either major repairs be made or it be replaced. At the same time, St. Columbas was enjoying an enormous growth, and the liturgies of the church were undergoing experimentation and change with a new Book of Common Prayer published in 1976. The interior of the church was remodeled to provide flexibility for the changes in the liturgy, and thanks to the work of acoustician, Lawrence Kirkegaard, the acoustics were greatly enhanced. The choice of the organ became all the more important as it would move out of the chamber and become part of the congregation, sitting in the north transept opposite a newly built gallery. The organ committee selected a Dutch-built Flentrop because of its reputation for fine workmanship using traditional mechanical action rather than electro-pneumatic construction then widely favored in American organ building. The organ was installed in the fall of 1981 and heard in worship for the first time on Advent I. Despite its lack of pistons and no swell shades, the instrument has proved itself very flexible within the Episcopal liturgy. 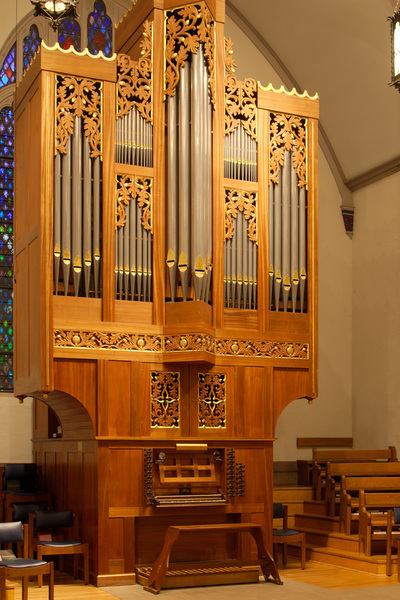 (The organ committee had noted that previous Flentrop organs had been installed at Harvard's Bush Hall, St. Mark's Cathedral in Seattle, the Oberlin Conservatory and Duke University Chapel.) St. Columba's instrument was also the first Flentrop to be built in the Washington, D.C. area, and was one of the early modern trackers in the city. Part of the dedication year included a celebration service in the presence of Queen Beatrix of the Netherlands, and the retired Senator William Fullbright who was responsible for many American organ students studying in Europe on Fullbright Fellowships. St. Columba's instrument was designed with 19 stops--a modest size well suited to the space at the time--housed in an ornate wood casing that reflected the carvings in the screen that now led to St. Aidan's chapel. 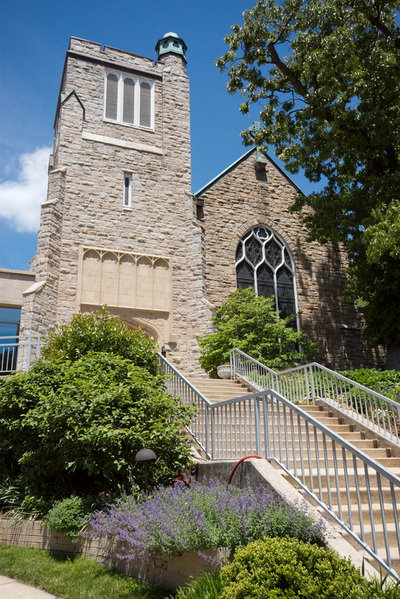 Over the next 20 years, as St. Columba's membership continued to grow, the church expanded its worship space in 1989 with a side extension and made it possible for additional seating in the Common for festival Sundays. The organ had to grow, too, so that its sound could adequately reach into the larger worship area. In the summer of 2003, Flentrop's organ builders spent a month at St. Columba's installing three new pedal stops, 16" Openbas, 8",Flute, 16" Baryton and extending the Sesquialtera (down 5 notes from C3 to G2) as well as doing needed maintenance on the 22-year-old instrument.